Auli is beautiful at any time of the year, but during the winter, once the snow has begun, it turns into a winter wonderland. 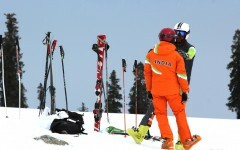 The skiing slopes here are some of the longest and finest in India, and attract skiiers from around the world. This is where you'll be learning the basics of skiing and and doing some snow boarding too. You'll have 6 days in this winter paradise, where you'll head out to the slopes every day and practise your skills. After a long day in the snow, you'll return to a warm lodge where you can relax and chat about your day's progress. This skiing course is open to anyone, including children over the age of 5. It is not difficult, and you will be guided at all times by experienced instructors. NOTE: This trip requires a minimum of 4 persons to confirm the booking. Located in the Chamoli district in Uttarakhand, Auli stands at an elevation of 8200 feet to 10,010 feet. The vast snow-clad slopes and the beautiful pine forests around make this one of the most popular ski destinations in India. 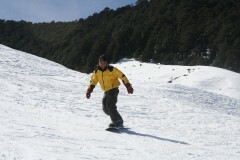 Apart from skiing, people come here to try snow boarding, go on snow treks, or just enjoy a winter holiday. The slopes are perfect for beginners who are learning skiing and will need increasing levels of difficulty. You'll be staying in a ski lodge that offers great views of the mountains. Your room is charming, with wooden floors, large windows, a private sit-out, attached washroom with geyser and Western toilet, and a comfortable king-sized bed. The lodge also has a lovely dining area/lounge where you can spend your free time admiring the views, reading a book, playing board games, and enjoying a hot cup of tea or coffee. • Earn your Basic Skiing Course certificate. 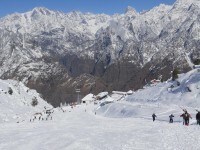 • Learn how to snowboard on the lovely slopes of Auli. • Enjoy the Christmas card landscape of Auli. • Have a snowball fight or make a snowman! • Stay at a comfortable lodge and spend days on the slopes. All clients (and parents on behalf of minors) have to complete and sign a mandatory client information and waiver form before starting the ski lessons. Clients must adhere to the instructions of the instructor at all times on the Auli skiing trip. Alcohol consumption or any form of intoxication while on this trip is strictly prohibited. For cancellations made 15 days or more before the start of the Auli skiing trip: 85% refund will be given. For cancellations made 11-15 days before the start of the Auli skiing trip: 50% refund will be given. For cancellations made 0-10 days before the start of the Auli skiing trip: No refund will be given. If you want to do snowboarding instead of skiing, you will have to request it one day in advance, and pay an additional INR 1500 per person. If the Auli skiing or snowboarding activity has to be cancelled due to safety concerns or weather conditions, no refund or compensation will be provided. The instructors’ decision on this will be final and binding on clients. For a family group, a max of 2 children below the age of 10 can be accommodated in a room at an additional charge of INR 1500 per child towards meals, bedding and snow activities. The fee for a personalized instructor is INR 2000 per day, per instructor. You may rent ski equipment such as ski suit, gloves, snow goggles, snow cap, ski jackets, ski trousers, snow shoes, snow boards and ski poles at an additional cost. Participants will receive a certificate for participation/successful completion of the basic level ski course at the end of this trip. You'll board vehicles at Haridwar Railway station at 06:30 hrs. The drive is about 9 hours, but you'll see the river confluences at Karnaprayag and Rudraprayag. You'll get to your hotel in Joshimath by evening, and can check in and freshen up. The hotel is peaceful and has spectacular views, and is perfect to relax and unwind after a long journey. Eat a hot dinner and retire to your rooms for the night. You'll wake up to views of the mountains today! Eat a hearty breakfast, and then it's time to set off to the slopes. 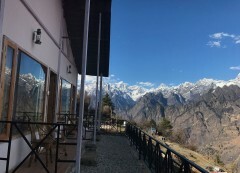 Auli is about 20 minutes away, and you'll be driven there. You'll meet your skiing instructors, and will attend a short briefing session. By 10:00 hrs, your first skiing lessons begin. Lunch will be given to you at the slopes itself, and your lessons continue till 16:00 hrs. After this, you'll be driven back, and can change, bathe, and spend the rest of the evening enjoying the views at your hotel. Overnight in hotel. Wake up early today and try to do a little light stretching or yoga. Your muscles might be a bit stiff from yesterday's adventures on the slopes. Today you head off to the slopes again, and will spend the day practising your skiing skills. You'll return to the hotel in the evening. Overnight in hotel. Fuel up with a big breakfast and set off for a fun skiing session. By now, you'll be much more confident on the slopes, and will really enjoy yourself. You'll come back to your room by evening, and can take it easy here. Overnight in hotel. It's your last day of skiing in Auli today, so make the most of it. You'll enjoy a full day of navigating the slopes of Auli, gliding past pine forests over the pristine snow. Don't forget to take pictures! By 16:00 hrs, you'll return to your deluxe hotel room for the night. You'll need to make an early start today too, so make sure you wake up in time for breakfast. You'll have a long 8 hour drive back to Haridwar, and will be dropped off by evening. Trip ends here. Rental for additional ski equipment such as ski suit, gloves, snow goggles, snowboard. These are available on hire. • Please carry specific personal or prescribed medical kit. Overnight in deluxe hotel room. 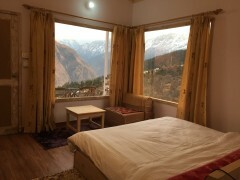 You'll spend your first night in Joshimath in a deluxe twin-sharing room (triple can be arranged too) with a private verandah and attached washroom with running water. You'll be provided with a hot vegetarian dinner today, and can pay an additional cost of INR 250 per person for non-vegetarian food. You'll eat a hearty breakfast at the hotel, and then will head out for skiing on the slopes of Auli. You'll be dropped off to Auli in a private sharing vehicle. You'll have a berak of about an hour on the slopes, and will be served a packed lunch here. When you return to your hotel in Joshimath, you'll be served a hot dinner. Your trip ends before night fall. You'll be served a hot breakfast early in the morning today. After that, you'll check out and will be driven back to Haridwar. It's a long drive and you'll be dropped off by late evening. Trip ends here. The closest airport to Haridwar is Jolly Grant Airport in Dehradun (35 kms away), but you can also take trains from most major cities in India to Haridwar Railway Station. Your operator will arrange your transport to the start point of your Auli skiing course.